Do we take classical music too seriously, are we in danger of being far too po-faced about an art form which previous generations regarded as a mixture of both enlightenment and entertainment. There seems to something essentially grim about 1000 (often more) people sitting in almost complete silence for an hour concentrating hard on a performance, their ability to comment restricted to applause at the end of the piece. This is even worse with opera where, thanks to Wagner we now sit in complete darkness as well as complete silence. And who thought that it would be a good idea to dim the lights in concert performances of opera, a practice which is becoming far to common. What we have lost is the social aspect of concert going. I don't mean the meeting friends and having a drink before hand, but the sense that you can listen to and talk about the music. Performance as a communal experience. Something that previous generations would have taken for granted. If you go to the Royal Festival Hall then the foyers, restaurants, bars and other spaces will often be buzzing with people but inside the hall, once the music starts, the listeners are forced to concentrate and not interrupt the sacred rite. Because that is what it has become, a sacred rite. The sacred rite of listening. Partly this is the fault of music post 1945, as it developed in ways which ignored the social aspect of concert going (in the case of some composers, ignored concert going all together). This was an element of the iconoclasm which went with the Boulez's call to burn down the opera houses. In fact you would have difficulty listening to a piece by Boulez in the social manner that people would have listened to Haydn. But what it means is we have a whole tranche of music it seems can only be appreciated by taking it very seriously, and in total silence. Anything else, and you can't hear it properly (see my review of the admirable classical club night Filthy Lucre). 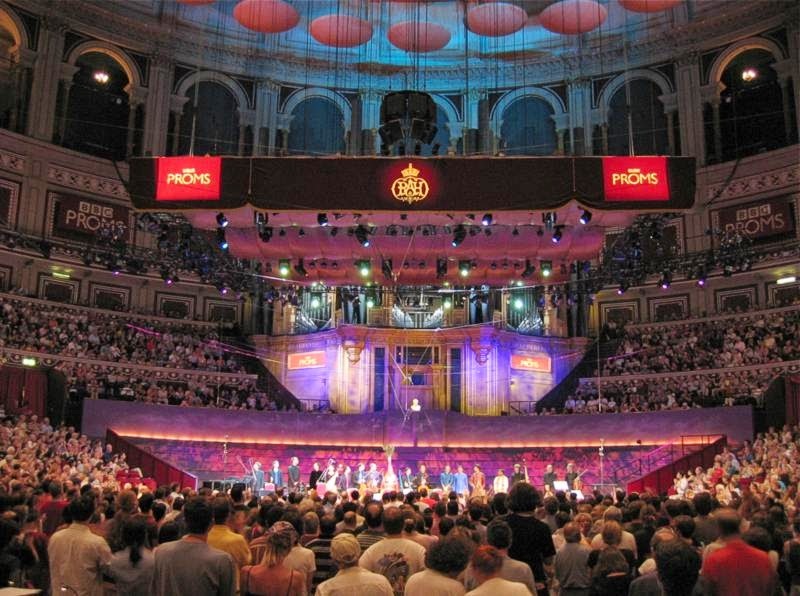 Partly it is the fault of the increase in size of concert hall, you would be hard pressed to allow audiences to talk and comment in the Royal Festival Hall if it was full, as you would think that the audience noise would overwhelm the music. But former generations must have had these problems, and there must have been acceptable mores, the right sort of social behaviour. 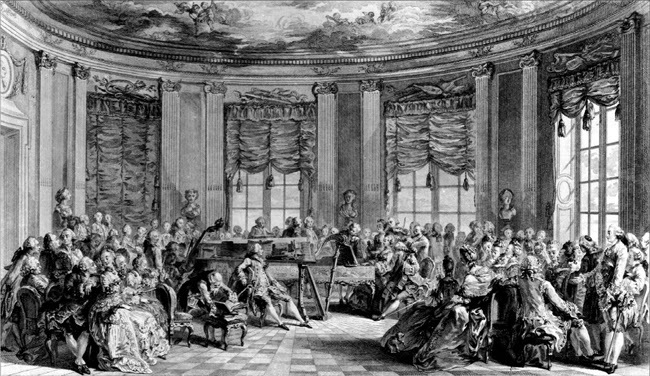 Just as we now frown on talking during a movement, or clapping, surely Haydn's audiences must have had to stay within norms. Though reading Jane Austen you do wonder. I once had a long illuminating interview with Dionysios Kyropoulos about historically informed stagecraft and he also talked about historically informed elements in audience reception and listening. We need to look more into this. The programming is also to blame, if you look at early Proms programmes various things stand out. They are long, they have a far greater pot-pourri element and the individual components were shorter. If you had to concentrate it was only for a movement not for an entire Bruckner symphony. There was a greater sense of fun, even in the more serious programmes. This type of programming still had strong links with the variety programmes put on at the Music Halls, whereby a serious ballet could appear cheek by jowl with a novelty act. When Covent Garden closed for re-building and the companies became peripatetic, someone had the bright idea of putting the Royal Ballet on at the Apollo Theatre in Hammersmith which was then generally used for rock and pop. It did not work, the po-faced brigade was horrified and if truth be told the theatre (before its own refurbishment) was rather scuzzy. But the idea was right, it was back to the work's roots. Ditto ENO's appearance at Glastonbury with the opening of Act 3 of The Valkyrie, this was more carefully managed and the content matched more closely to the venue but perhaps it is the sort of thing we ought to do more of. This doesn't just mean moving to a non-traditional concert venue or altering the concert format, because what usually happens is you take your existing audience with you. I have been to a few 'alternative' concert nights and those presented by established ensembles seem to attract the regular audience, my grey haired contemporaries who would seem far more comfortable with sitting in a regular seat in a concert hall than squatting on the floor or lurking cafe-style. This is the problem, we have taught two or more generations of concert goers that the only way to listen to classical music is to partake of the sacred rite. I myself prefer listening to music this way, it was the way I was brought up on and it helps me concentrate. But there are still moments when I could turn to D. and mention something that occurs during the performance, or some memory which a phrase triggers. And sometimes, when things get really serious and you are not completely in the mood I wonder what it would have been like without the sacred rite of listening, when concerts could be fun too. Update: One of my correspondents commented that I should have been at the Simon Bolivar Orchestra's concerts at the Royal Festival Hall this week, when 'There was a great sense of connection and entertainment on both nights. A sense of real communal enjoyment'. But another correspondent does not understand why it might be OK to ask someone to be quiet in the cinema, but if you do that in the concert hall you are taking it too seriously. Though my intent in the article was not so say what was better but to make us think more about the whole experience. I started going to concerts in the 1970's and total silence was the expected behaviour and most of the time that is what I personally am comfortable with. But I still worry we are missing something. Update 2: Another correspondent remembered a Kabuki group visiting the old Sadler's Wells Theatre and being most surprised by the uniform reverential silence with which their pieces were received by London audiences.In Japan the audiences chatted through bits they found boring, paying attention for the interesting bits and the performers found the total silence unnerving. She wouldn’t want to lose that attentive silence such as at the Proms or at Symphony Hall in Birmingham, but sometimes the more relaxed approach of say, jazz audiences seems about right ...applause or murmurs and calls of appreciation when something very special has happened. At those times audience reaction becomes an integral part of the performance.